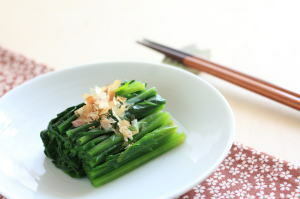 Horenso no Ohitashi ('ほうれん草のお浸し', is classified into appetizer), is known as Boiled Spinach in English, and 煮菠菜 (Zhǔ bōcài) in Chinese. It is the washoku. Soy Sauce, Dried Bonito Flakes, Vinegar.